Don’t miss free live music in the Cinnabar with Slings and Arrows playing a blend of Americana and Southern Folk Rock on Friday, February 22nd and Saturday, February 23rd from 3:30 pm - 6:00 pm! 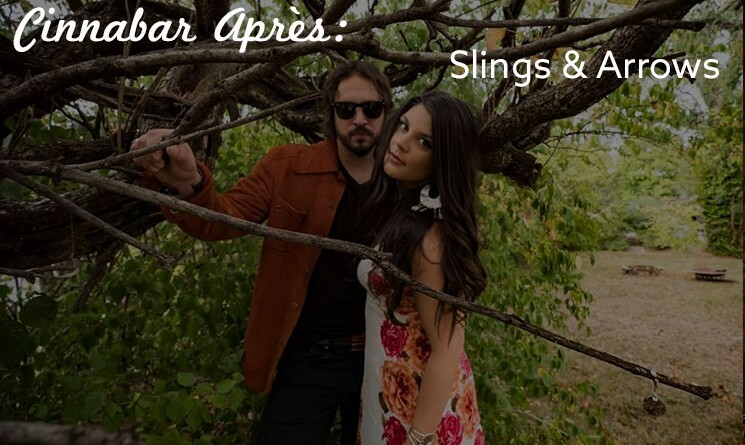 Slings & Arrows, a Nashville-based duo comprised of musicians Zach Broocke and Marlaina Youch, formed in 2014. Zach hails from Waukesha, Wisconsin, and has been recording soulful Americana Rock music since 2004. Marlaina was born and raised in Seattle, and has been writing and singing Country/Blues music since 2009. The two met in Nashville three years ago during a co-write; a write that led to the creation of "Black Leather & Booze," the most popular song from Marlaina's solo EP, the entirety of which Zach produced. Before officially forming Slings & Arrows, the pair sang and played together for over a year developing onstage chemistry and perfecting their collective sound. They blend elements of Rock n’ Roll, Country, and Blues, resulting in music that has garnered praise from ears across the musical spectrum. Although their debut EP has yet to be released, mainstays from their live shows such as “Tug of War” and “That Was Me Then” will certainly leave you eager to buy and listen over and over once it does. However, to their captivated audiences delight, they both have past solo records filled with haunting melodies, entrancing instrumentals, and relatable lyrics that will certainly ease the wait and leave you eager for more. Notable recent performances include Sundance Film Festival (Park City, UT), Hotel Cafe (Los Angeles, CA), The Bluebird Cafe (Nashville, TN), Jack Daniels 150th Anniversary (Lynchberg, TN), Musician’s Corner (Nashville, TN), Lightning 100 Local Artist of the week, to name a few.